After reading a countless number of submissions, which I truly love doing, I’ve formed the bad habit of automatically assuming what car I’m going to find in an email based solely on the email’s description. 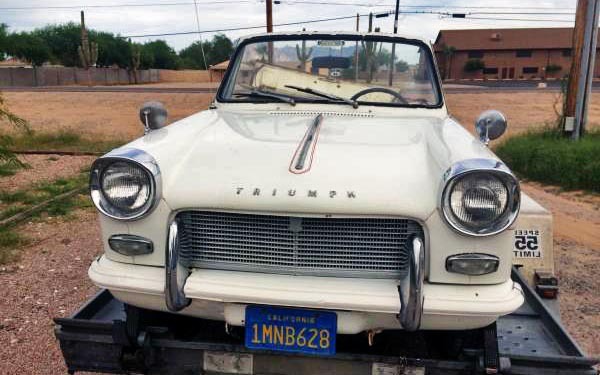 In the case of this submission, I saw the words Triumph Convertible and I immediately concluded that upon clicking the link I would find a Spitfire. What I discovered was anything but a Spitfire, although the two do share the same chassis. 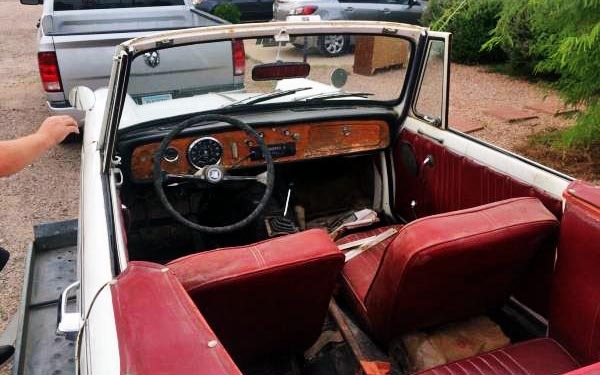 While this 1966 Herald Convertible might share much of its mechanical systems, it is a different kind of convertible than the Spitfire. This one looks to be in solid shape, although it will need some attention. Find it here on craigslist in Phoenix, Arizona for $3,000. Thanks goes to Paul G for the tip! The Herald was introduced in 1959, with a body designed by Giovanni Michelotti. Standard-Triumph leadership called for a new car that offered great visibility, a modern look, and that could easily be modified for various body styles. To achieve the modularity that executives demanded, the body panels were bolted together rather than welded and the entire body was then bolted to an independent chassis. The new little car went on to be an incredible success, with well over 500k built in four different body styles. It had a few issues though, like a rear suspension that had a tendency to roll under the car during hard cornering and less than stellar performance. At release the Herald was fitted with a 948 cc inline four, but after just a few years Triumph upgraded it with their 1200 and eventually a 1296. The seller doesn’t state whether this is a 1200 or a 12/50, but are identical other than power output. Power output should be anywhere between 48 and 51 horsepower, but the 1,600 pound curb weight should help offset the lack of power a little. 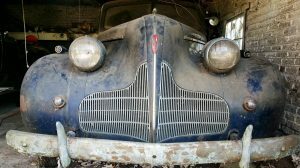 The seller also doesn’t state the current condition of the motor or transmission, so plan for the worst and hope for the best. The interior looks surprisingly complete and the body looks solid, so hopefully the motor is in as complete and rust free condition! The Herald and the Spitfire might be similar from a mechanical standpoint, but these two little British roadsters are quite different. Sure they share some of the same issues, but they both have their own sets of strengths and weaknesses. The Herald is a bit more spacious and is less likely to cause feelings of claustrophobia. It might not be the best convertible ever built, but these little cars can be fun. They are simple, fairly easy to work on, and quite unique. If this one is as solid and complete as it looks, it could make for a great buy, just be sure to negotiate on that asking price! 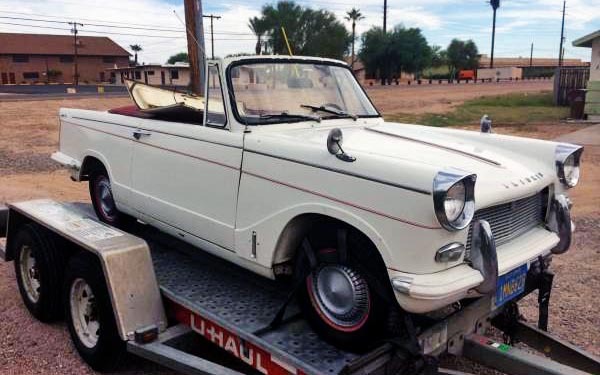 So would you take this Herald or would you rather have its Spitfire sibling? Great cars, from what I remember. It doesn’t seem to show in the pics, but the engine is easy to work on – the entire bonnet (hood) including front wings tips forward. You can see the catch just in front of the door. A California blue plate car now in Phoenix—probably the best places for a vintage open car to be from. It looks pretty good on both the top and bottom sides, and would make a nice little summer runabout, but those swing axles are a limitation that would make me want to spend a bit more and go for something like an MGB or TR6 instead. 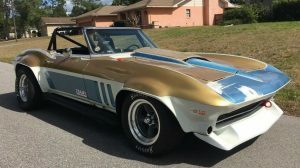 I can speak from personal experience having owned one of the these cars…got it in 1971 as my first car…despite only having only 55k on the clock it had many issues. Every rubber part in the brake system had self destructed because someone put regular brake fluid in the sytem. The shift lever would disappear through the tunnel. The voltage regulator would short out regularly, the rubber bumpers turned to chalk, but despite the best efforts of a 17year old it would not blow up. 30 in first, 50 in second, 70 in third and 4th was good for 80 or so if you had time… The swing axle rear did try to kill me several times. In Europe surrounded by friends with 1200 Beetles it was a Hot Rod! But these listings have become a private joke in our family…Does anybody actually have a running Herald in good condition or all them doomed to be yard art? Thanks you Jimbosidecar for my morning chuckle. …..very pleased to say there are shedloads of these left in the UK. The 2 litre Vitesse model (esp in Mk II form) that are real flyers. There is a whole aftermarket industry here in the UK and the whole range offer fun, practical and cheap to run cars in the 21c. The convertables such as this more so…..though the vans and early coupes are much sought after too. The grill on this car – but in the UK – hid a 12/50 engine – tad more go than standard. In suburban areas of the US it would offer good local transport with a bit of style and part over here are easy. I know of several that have done long European trips in the past 2-3 years with utter reliability. Def worth a try !! I owned one of these (used) back in the late 70’s. It was delightful to drive and attracted a lot of attention. Unfortunately, the floor pan was a spiderweb of rusted fragments (under brand new OE floor mats!). I loved the car anyway – better for me than my brother’s MG Midget, or my friend’s Austin Healey Sprite. Yes I actually have two 1965 Triumph Heralds that I enjoy driving very much . I have had one of them since 1971. These are great little cars, easy to maintain. I would rather have my Herald than ANY other car by CHOICE! :re Jim S, yes there was a 6 cylinder version called the Vitesse. Came initially as a 1,6 litre and later as a 2 litre. Most came with slanted double headlights. 2 litre good for some 85 bhp and +/- 90 mph. I hope those guys from the Alpine don’t show up, I don’t think they like me. Anyway, I was awakened one day by a friend of mine who said a guy at the bar wanted to sell a running Triumph for $100. I stumbled around, found some money and sent him to buy the Triumph while I put my drunken self back to bed, with the idea I’d just bought a TR-3. When I finally woke up I went into the kitchen to make coffee, on the table was a title, bill of sale, keys, $15 and a note. The note said he’d bought the car for $75 and kept $10 as a finders fee. I got dressed, got coffee and went out on the porch to look at my TR-3. Damn, it was a Herald sedan, I didn’t know that at first because I’d never seen one before. It was a horribly oxidized baby blue with rust spots, definately not a TR-3. I finished my coffee and grabbed the keys, because afterall it was a running car. It started right up and died, and again, and again. When it finally would stay running it was only running on three. Then I realized it had no brakes and it was very hard to get into gear, but I got it moved out of the driveway and up behind the house. It was in no uncertain terms a real pile. To make this short, everytime I fixed one thing, something else would go out. I poured about $300 into it and it didn’t respond. Finally ate my loss and traded it for something or other. Lesson learned, never let anyone else purchase a car for you and never buy a car when your drunk. I’m not a big fan of English cars, but these homely little cars have a certain amount of charm. This one looks pretty good, but since I know nothing about them I’m not sure if it’s even worth $3k. 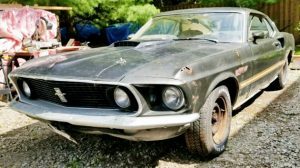 I figure someone will buy it and put it back on the road, it just won’t be me. I also had a running, driving, somewhat-scruffy-but-generally-clean Herald sedan that I sold on Ebay about five or six years ago. That car brought $1800 at that time. 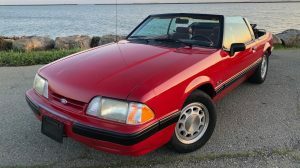 So I think in the US market, $3K is probably a reasonable asking price for this convertible, assuming it doesn’t have any major mechanical issues. It’s disappointing that there are no engine compartment photos or anything whatsoever in the description regarding its mechanical condition. It’s always very interesting to see how the US car community sees UK ‘bread and butter’ cars. This car would be great to be shipped back, sorted and used for Continental touring. Check out it’s surprising prices (in pounds) on carandclassic.co.uk. The site also gives you a peek at where some of your older US steel has driven off too !! Growing up in SoCal, these were a common sight. I still like to see them. I don’t see how you can go wrong for the 3K…………heck……..refrigerators cost that . Paging Richard Hammond! We have a another amphibious car for you. Actually, have Richard tell James May. 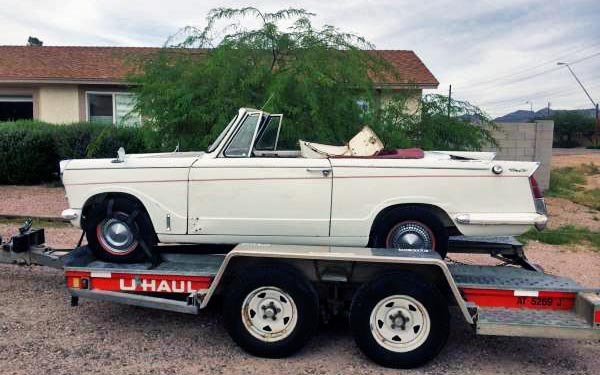 We have a ’63 Herald convertible that we drive regularly. Charming little car, just don’t plan on getting there in a hurry! My wife adores it (it’s hers). I did put a set of Spit SU’s on it to improve things a little. The gents from Top Gear UK made one of these into a sailboat, rather unsuccessfully if I remember correctly.